Karbonn is an established telecommunication brand in India and has launched a series of Octa phones all at a price less than Rs 15,000. 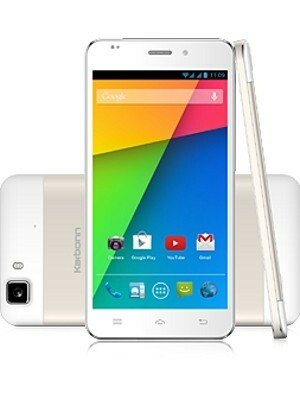 Among its new classic creations is Karbonn Titanium Hexa which is an interesting phone to look forward to. It is the first piece to have Media Tek MT 6591 Hexa core chipset. Karbonn Titanium Hexa is a slender and trendy piece and measures 6.9mm; its thickness comes with its amazing light weight body. The handling effect of the phone is smooth and feels light. The lightness is contributed by double shade black metallic at back which leads to quality finish. The feel of the phone is decent, and the creativity here lies in the fact that it is dense and light weight. At the back there is a speaker grille, which indicates the portion of sound can be heard when the phone is inverted. The back case is not detachable; the top part of the phone is where the camera is fitted to fit in microSD and SIM card. It is interesting to learn that Karbonn Titanium Hexa functions differently compared to other phones where the back case is not removable and the SIM card and microSD can be fitted on top of the phone. The display compartment in Karbonn Titanium Hexa is pretty advanced in sync with latest advancements in display technology. The display technique used is called Low Temperature PolySilicon (LTPS), and the display output is quicker and happens when amorphous silicon is replaced with low temperature poly. The display output is indeed impressive. The viewing angles are admirable and the effect is quite pronounced from any angle. The display make is full High Definition, which contributes to phenomenal viewing experiences where the image quality is crisp, and certainly superior than Karbonn Titanium Octane Plus. The other interesting features are is fingerprint and scratch resistant. The fingerprint resistance is contributed by oleophobic coating. Karbonn Titanium Hexa is tailored with powerful 13MP sensor supported by LED flash. The phone is not unique in terms of advanced camera technology, but the image output is pretty crisp greater than many 13MP camera used, and most of these operate on MT6589T and MT6589 chipset. The 13 MP camera is robust to capture images of well structured and historical buildings, and awe-inspiring sceneries. The interior storage capacity is 16GB which can be expanded to 32GB via micro SD card compartment. The storage output is pretty decent taking into consideration the price of the phone. The battery potential of Karbonn Titanium Hexa is2050 mAh, and sources have stated that although the battery output is good, it is not extraordinary to operate a full High Definition display. Karbonn has not provided details on battery residues, which might be displayed on the phone. It will be exciting to learn about the actual battery power post launch, and whether it can match up to the power of full High Definition display. Karbonn Titanium Hexa operates on Android 4.4 Kitkat operating system, and an important point to note is Karbonn is the first devise to provide a high end Android KitKat operating network. The chipset make is 1.47GHz MT6591 a True Hexa core chipset from Media Tek, which is tailored with 2GB RAM and Mali 450 GPU. The chipset quality is greater than the earlier piece which is MT6589 series. The phone scrapped through bench mark examinations, the result obtained in Nenamark score was 55.6 fps and in AnTuTu it was 21000. Karbonn Titanium Hexa is a value for money product, for its price, some of the breakthrough features are Android 4.4 KitKat, USB OTG support, 2GB of RAM, 16 GB internal storage, powerful chipset that renders a crisp and bright display. The main concern was 2050mAh battery, which might not be sufficient to operate a 5.5 inch full High Definition phablet display. To provide an overview of the features of Karbonn Titanium Hexa it functions with robust connectivity options such as GPS with aGPS, USB OTG, Bluetooth 4.0, Wi-Fi 802.11 b/g/n and 3G. Its battery output is 2,050 mAh, external storage capacity extends to 32GB, interior storage output is 16 GB, and secondary camera capacity is 5MP. The camera make is 13MP with video recording at 30 fps, full High Definition 1080p and LED flash. The software processor used is Android 4.4 KitKat; the memory capacity is 2GB. The processors used are 1.5 GHz Hexa core MT6590 processor with Mali 450 GPU. Its display dimension and resolutions are 5.5inch LTPS LCD display and the resolution 1920×1080 pixels. Karbonn Titanium Hexa sports a vibrant design; the vibrancy effect is so robust that two shades are visible on front display. This makes Karbonn Titanium Hexa a unique phone to own. Users can scale through many apps all scattered in the front screen itself. The optimum convenience factor lies in the finger and scratch resistant properties, which is amazing for a mid-budget phone; such a feature is found in top quality high end phones like Sony Xperia Z. The back case is not removable and users can fit in microSD and SIM card on top, which again makes the usage process convenient and is not too time consuming as well. Karbonn Titanium Hexa although a mid range phone is injected with advanced software processes such as Android 4.4 KitKat and 1.5GHz Hexa core MT6590 processor with Mali 450 GPU. Those who are keen to buy Karbonn Titanium Hexa it is a worthy purchase to enjoy pleasurable capturing moments with family and friends and also browse through amazing tunes and the fun factor is sky high because of the dynamic crispness and clarity. The phone market in India has revolutionized to a great extend, the backbone for the major progress in mobile industry is the launch of budget phones packed with advanced features. The 5.5 inch LTPS LCD screen is amazing to make video calls and chat with friends or relatives who reside in another country or city. So buy the Karbonn Titanium Hexa and have a blast with its incredible versatility and clarity. Join My Newsletter to get latest updates in your inbox. Share on social networks and get exposed. Thanks for dropping your comment. Keep coming.